Where will The Low Carb Universe be held? The Low Carb Universe event takes place at Hotel Espléndido, Puerto de Sóller, on the beautiful Mediterranean island of Mallorca, Spain. This hotel is nothing like the ordinary conference hotel. That gives us many possibilities and advantages! What about attending a workshop in the cosy Library or do some training in the garden by the pool? Discuss the best ketosis tips on a terrass overlooking the Mediterranean? The Low Carb Universe will give you memories for life! Mallorca (part of the monarchy of Spain) is the biggest of the Balearic Islands in the Mediterranean. 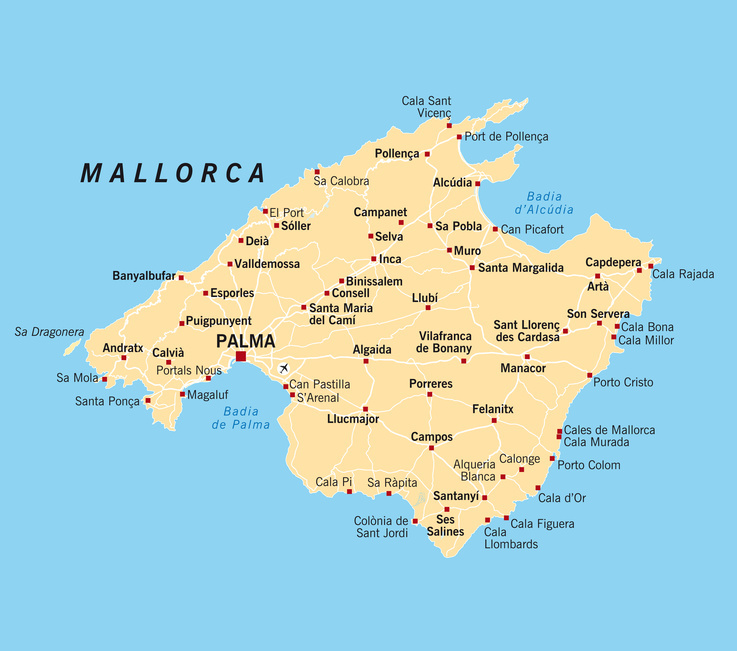 It has about 900 000 inhabitants, more than half of them live in the main city – Palma de Mallorca. Mallorca has four official languages: spanish, catalan, mallorqui and balear. Learning English is not obligatory in school, but more and more people learn to speak English. Clever, since the largest source of income is tourism. Actually fifteen million tourists choose to visit Mallorca every year. During July (high season) approximately four million passengers pass through the airport! The Low Carb Universe takes place in Puerto de Sóller (35 km from the airport). This part of the small city of Sóller is a natural harbor – a wonderful little gem by the foot of Tramuntana mountains. The landscape is agricultural and Sollér is well known for its fantastic oranges. In 2011, Tramuntana became an Unesco World Heritage. The mountains are a significant example of how agricultural development has adapted to the landscape to be able to use the scarce available sources: terraces, watering systems and road networks. Espléndido is a lovely four star hotel with superior service and food. All food served at the event is low carb. This IS a real low carb event! The hotel is situated a fifteen second walk from the private hotel beach! Here you can swim in the beautiful bay of Puerto de Sóller. Or have lunch outside, resting your eyes at the surroundings. The rooms (single or double) are comfortable and equipped with free wi-fi, hair dryer, TV, DVD, CD, DSL, AC, mini-bar, safe box and a Nespresso coffee machine. In your room you’ll also find a cosy bath robe and slippers. Do you want to relax? Or pamper yourself! Maybe spend some time at the gym? You’ve got it all at the hotel! As well as two heated outdoor pools, Finnish and Turkish saunas, thermal showers and cosy waterbeds. After a long and interesting day with a lot of new knowledge, you can socialize with the rest of the gang in the cocktail bar and lounge. Of course they’ll serve low carb-adapted drinks! Or jump on the old tram to Sóller for an evening stroll. Meditate on the beach, or open the window in your room and just enjoy the fresh and mild air and the sound of the sea. Food is excellent in Espléndido! A warm buffet with meat, fish and vegetables for lunch and dinner. No special dress code. Except for the last night, then you’re welcome to go all in for the party in the lounge! Music and dancing all night long! Do you want to know about our other events?